When thinking of Christmas, most people’s thoughts go straight to green and red. The classic pairing has been a Christmas staple for years without much competition. 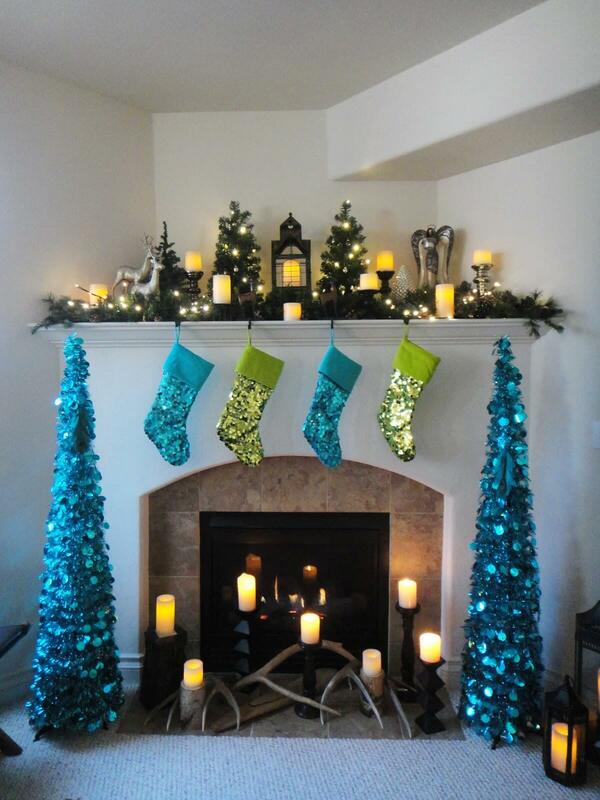 However, when you are looking for something dazzling and new, consider opting for blue Christmas decor this year. The world’s most popular favorite color, blue can be both warm and cool at once. It can be exciting or cozy, bright or tranquil, and it goes great with a classic wintery white. With blue Christmas decor, you can stick with a dark and mellow palette, or you can liven things up with a shock of electric blue. You can even weave different hues together to create a look all your own. 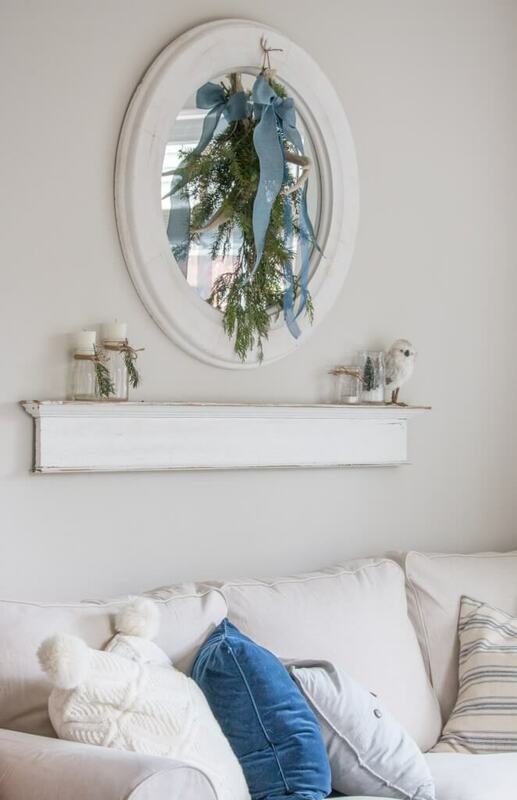 Although not a traditional Christmas color, blue has always been associated with the icy frost of winter, and when you use it as decor, it is like you are bringing the chill of the softly fallen winter snow into your warm, cozy home. These 23 ideas will help you start the decorating season on the right foot. 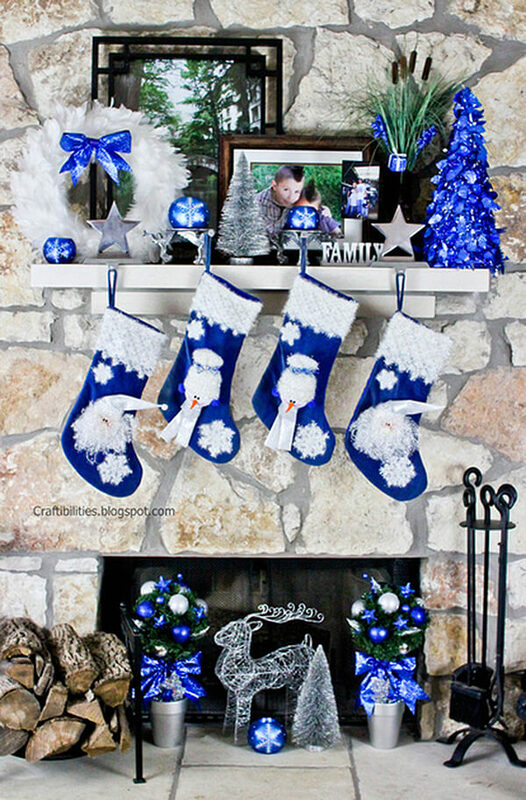 After getting some inspiration from these gorgeous decor ensembles, you will be ready to ring the holiday in – but this year, you’ll be dreaming of a blue Christmas. If you are looking to change up your decor this year but don’t want to spend a fortune on a new set of ornaments, consider creating your own. 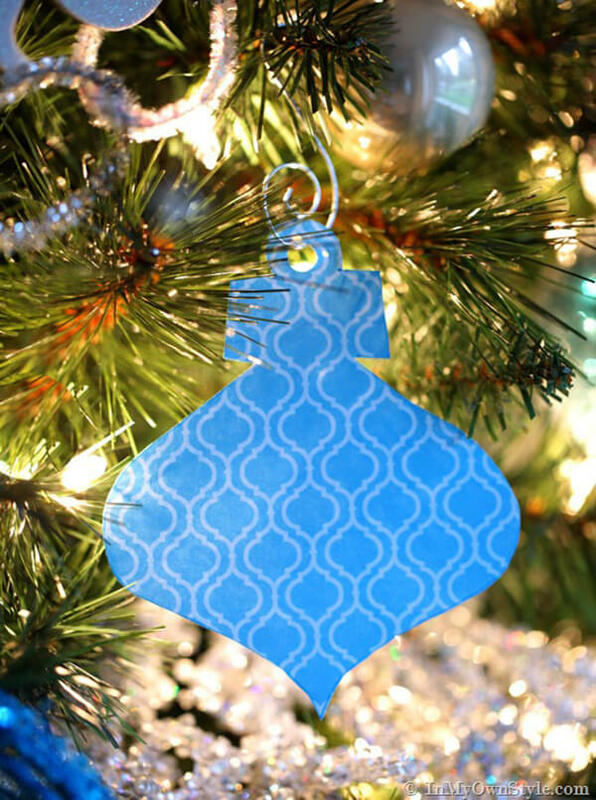 With these ornaments, you simply select your favorite blue craft or scrapbooking paper, then stencil and cut out some lovely shapes to adorn your tree. Sometimes it is hard to fully capture the impact of flawlessly styled and wrapped gifts when they are spread out under the tree. With this approach, however, stacking the presents for all to see shows off your crafty work and creates a beautiful piece of art. The multiple colors and textures of the blue and silver paperwork together to create a lovely Christmas collage. 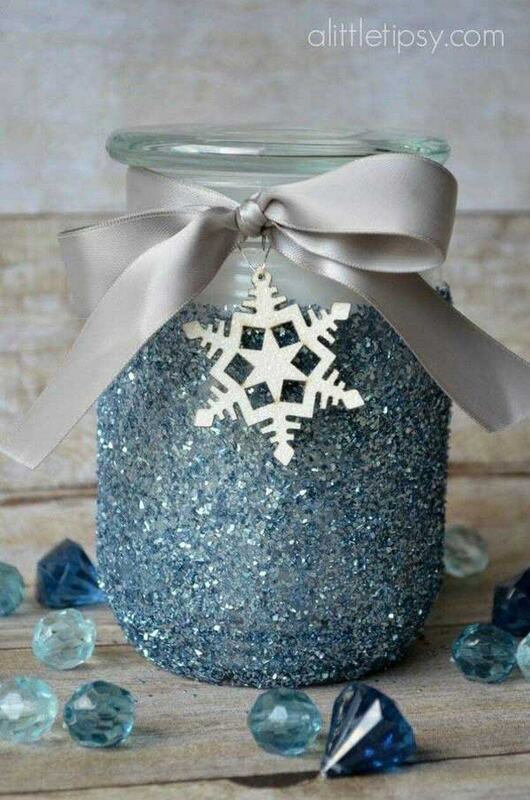 This fun and easy craft is great for the whole family and creates stunning ornaments. Using just a lovely dark blue nail polish and white glass ornaments, you can create this look in no more than a few minutes. 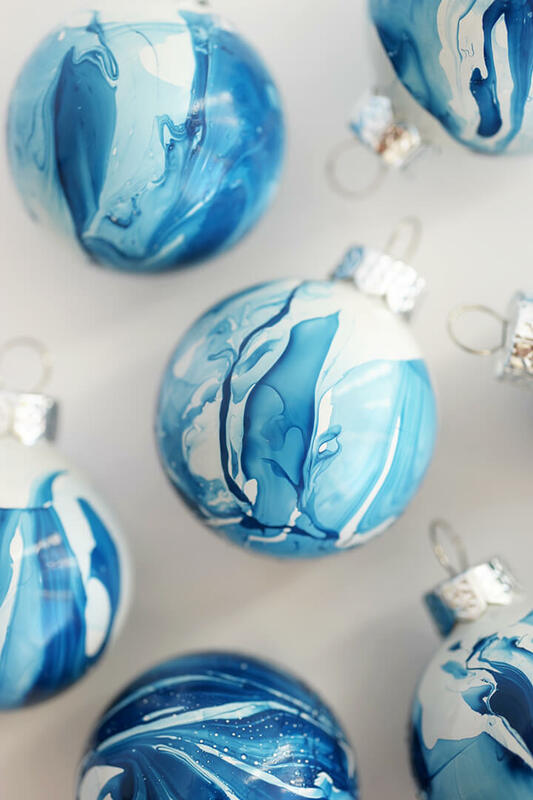 Another similar option is to fill clear ornaments with a few acrylic paint colors and shake them until the insides are coated with a gorgeous marbling effect. 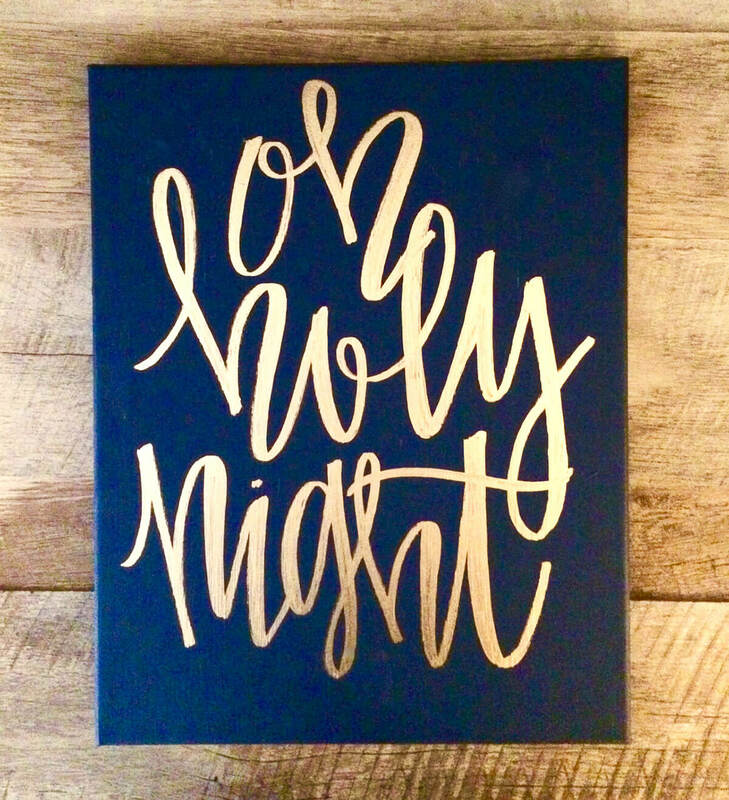 Although this print is available in multiple colors, the dark blue and gold version of this 11”x14” canvas decor works perfectly together and will add an atmosphere of Christmas cheer to your home. The midnight blue captures the essence of night, while the rich gold emphasizes the importance and splendor of this most beloved holiday. Why pay a premium for a decorative candle that may or may not match your theme when you can easily create your own at home? This makes a great gift for a friend or a dazzling piece of holiday decor. 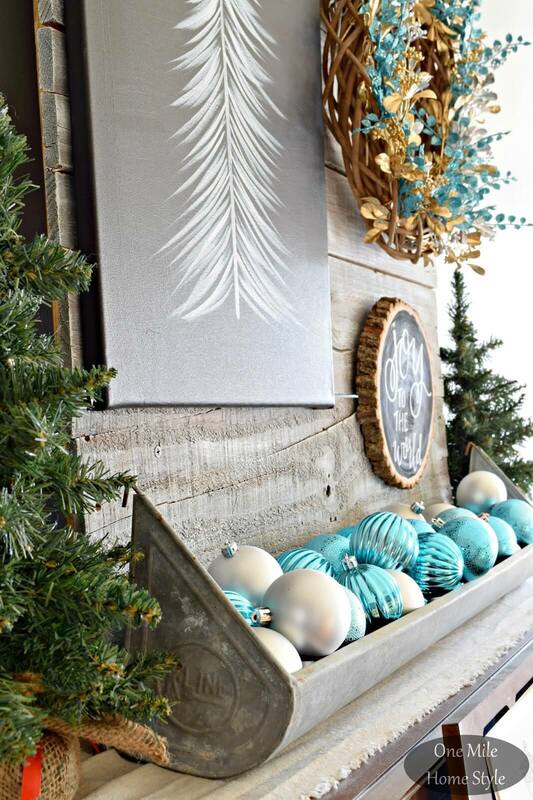 If you use at home, choose your own glitter and accents to make this piece a great fit for your own blue Christmas decor. 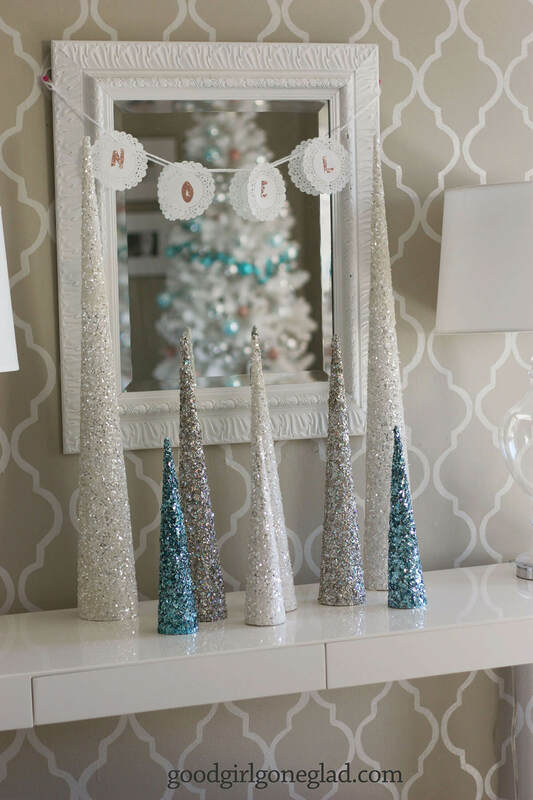 Reminiscent of a snow-covered winter forest, these cool-toned glitter spires create a lovely display for any mantle or side table. The varying heights and colors give this display visual interest, and its icicle shape and bright blue highlights create a very fun and festive feel. A sweet and simple “Noel” doily softens the sharp points to keep the look homey. Sharing gifts with friends and neighbors is a great holiday tradition, but sometimes the plate of cookies can feel repetitive. 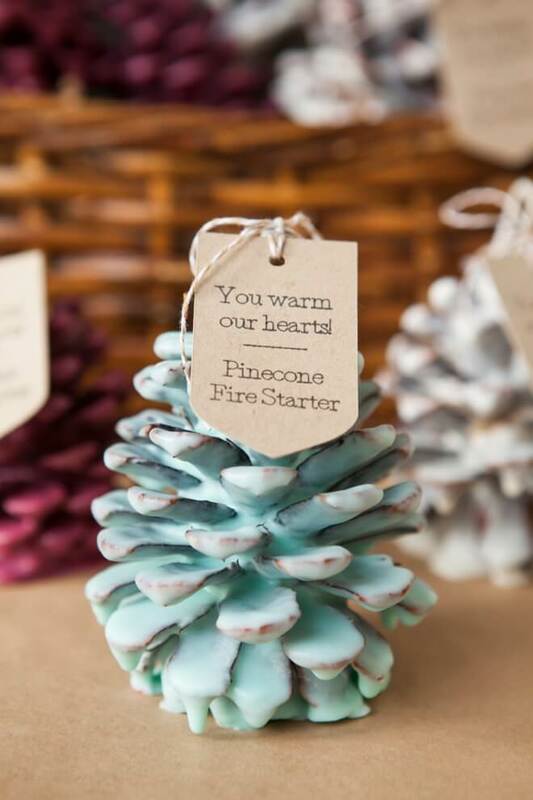 This year, instead of baking, create this lovely blue pinecone fire starter. This practical gift is so pretty that recipients will love storing it near the fire as decor until they are ready to cozy up with a blazing hearth. This cozy and friendly holiday wreath looks stunning with its natural wood and sea-toned coloring. 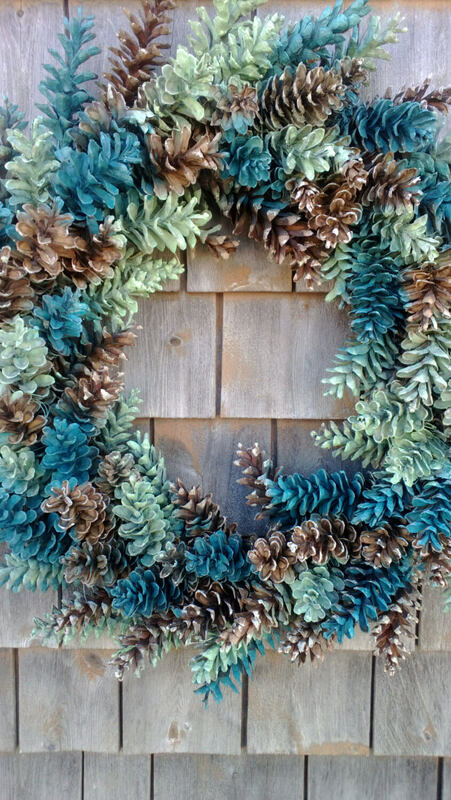 The pinecones take on an almost leafy quality when painted in the teals and blues. This effect makes the pinecones seem delicate, softening the wreath into something light and breezy. 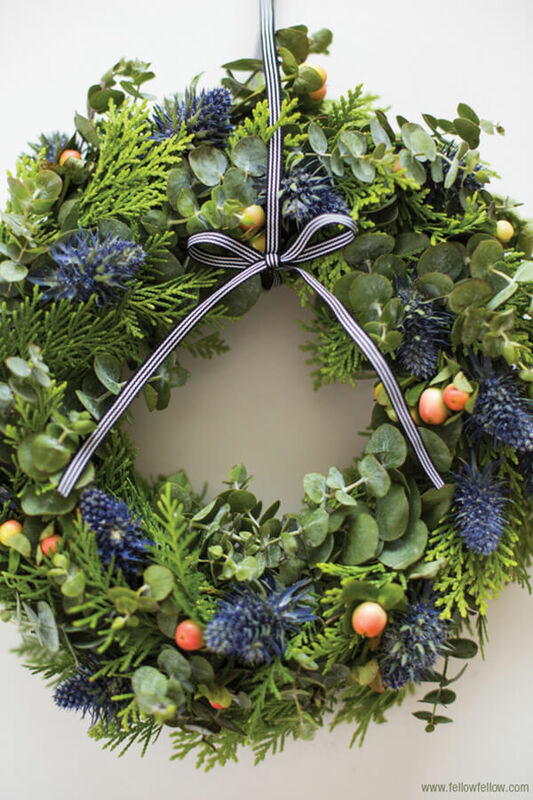 At around 24 inches in width, you can place this wreath on a door or bare wall. 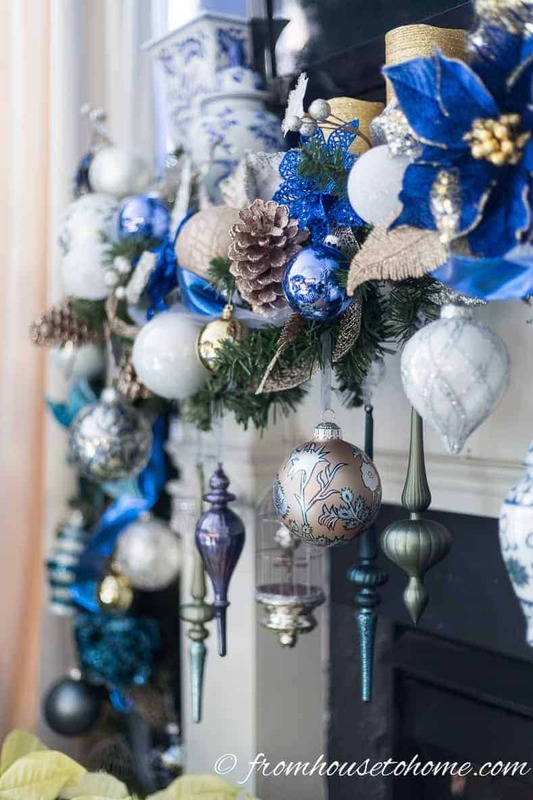 When you decide to go for blue Christmas decor, you can play with the tones and colors to mix your favorite hues into a single, cohesive icy piece. This wreath takes natural pines and adds a pop of sparkle and shine by mixing and matching ornaments of all sizes and textures. Add a bow for the final holiday touch. With all the beauty and elegance of a winter wedding bouquet, this DIY foliage wreath, featuring a perfect pop of blue, makes for a classy Christmas display. Be sure when selecting your foliage to choose hearty plants that will do well without water, and consider occasionally replenishing your wreath with fresh springs. When decorating your home, balance is always important. The warmth from lovely candles and the fireplace blends perfectly with the snowy winter silvers and a pop of icicle blue on the natural evergreen garland. This display really embraces the wintery notion of enjoying the cold and snow, all while keeping cozy and warm in front of the fire. Having a fresh Christmas tree is such a treat, but the mess and hassle of falling needles and dying branches can be a pain. This petite tree is the perfect solution. 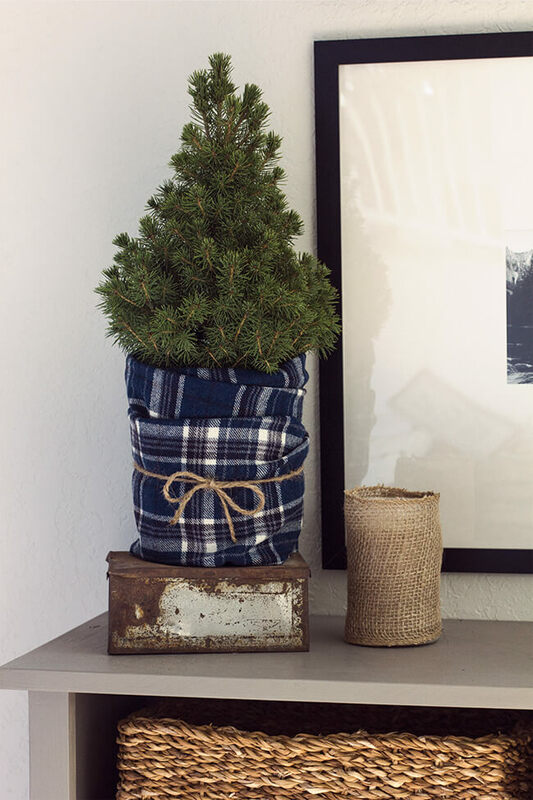 Simply buy a potted evergreen and cover the pot with some cozy blue flannel. After winter, find a spot to plant your little evergreen and enjoy its happy glow forever. Going all out for a holiday display is a fun way to brighten the season. 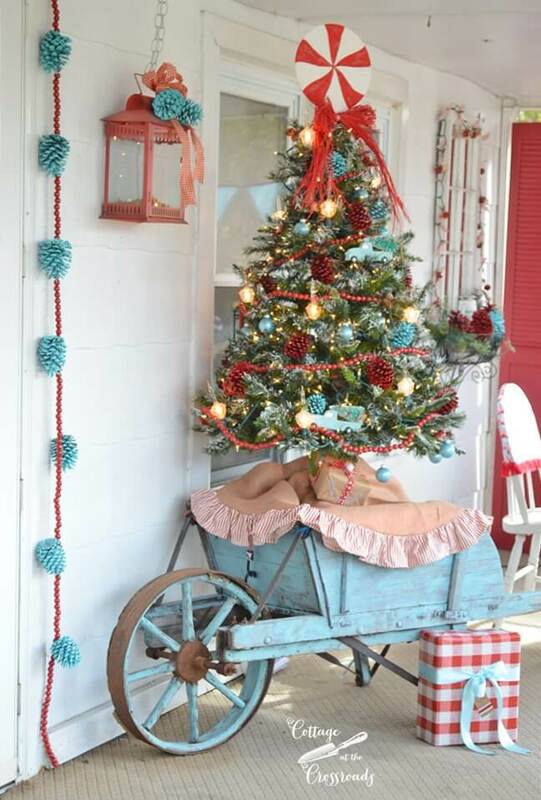 This farmhouse-inspired blue wagon Christmas display is great for welcoming guests into your home with a warm burst of holiday cheer. To create cohesion with this look, tie together the colors with other smaller pieces of decor. 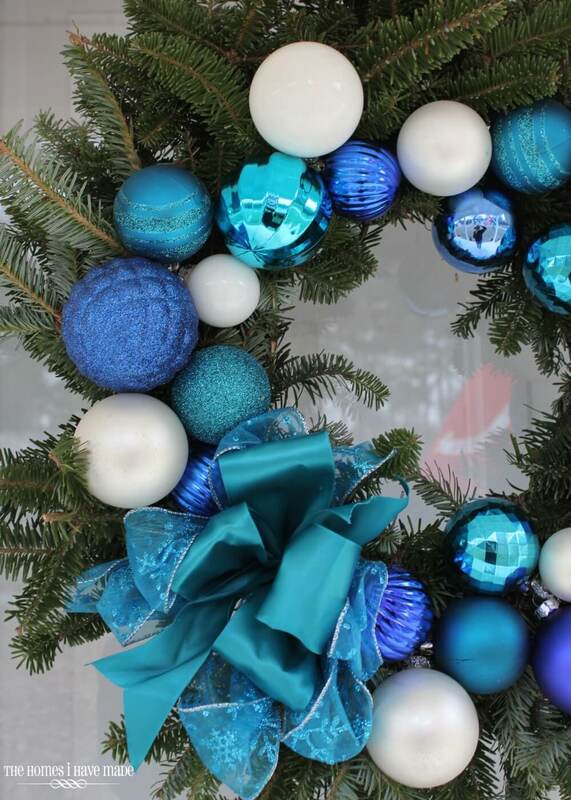 A great way to decorate for the holidays with blue is to pair it with its natural counterpart, green. A bright swag of fresh pine looks nice on its own, but it really becomes a decorative piece when you add a delicate swath of cool blue. It is a simple look, but the end result is lovely. This look does a great job of incorporating rustic antique farmhouse elements with classic holiday decor for a cozy, chic look. 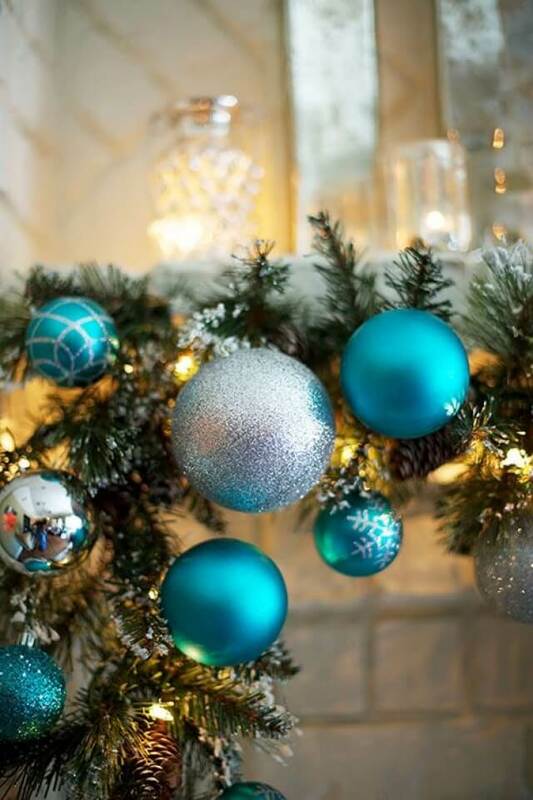 The use of multi-textured sky blue ornaments with the natural woods and bright white accents creates an overall inviting look that exudes holiday cheer. Pair this ornament planter with your favorite hanging staples for a gallery-style look. Mini-trees are a great way to spruce up any holiday decor, but sometimes it can be hard to decide where to place them. 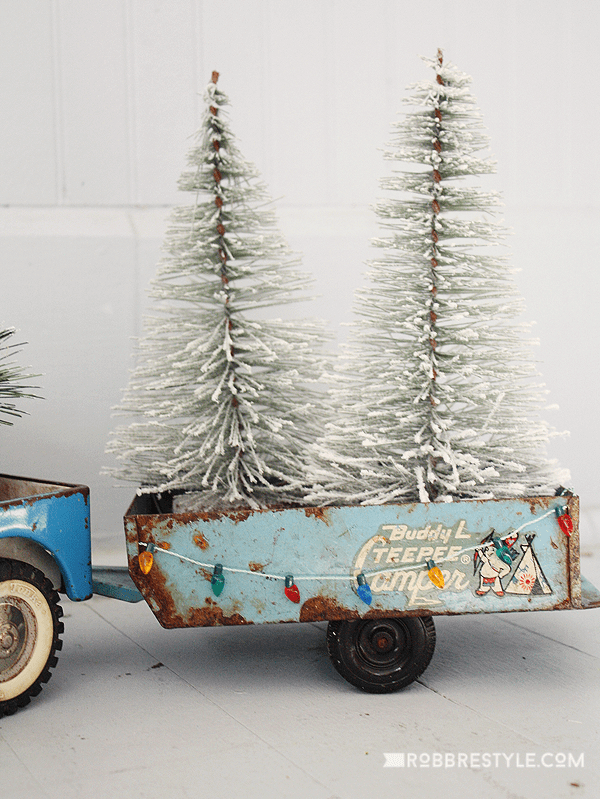 This antique toy mini-trailer is the perfect answer to this problem and creates a charming look. The addition of a strand of lights ties everything together in this make-you-smile display. These lovely home-dipped ornaments not only are a fun family craft, but they make for a super cool addition to your holiday decor. 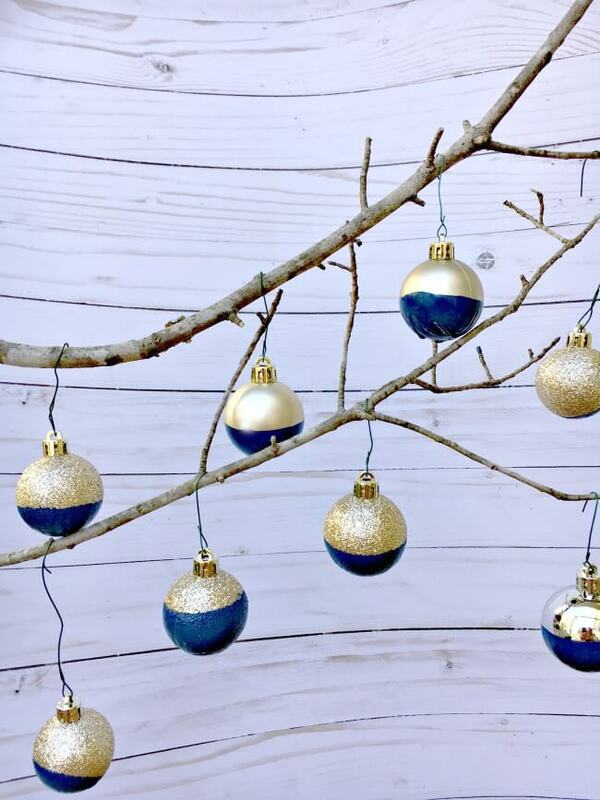 Pick out your favorite inexpensive ornaments, then bring them home to dip in your favorite rich blue paint. To add variety, you can even dip them to different depths. This bold and delightful blue is great for a family looking to have fun and enliven their décor. Perfectly matching the hue of bright blue LED lights, you can use this color theme throughout your home. Incorporating multiple elements such as stockings, bulbs, trees, and wreaths gives interest to this fun and festive look. When hosting your next holiday party, consider this fanciful display for the foot of your stairs. 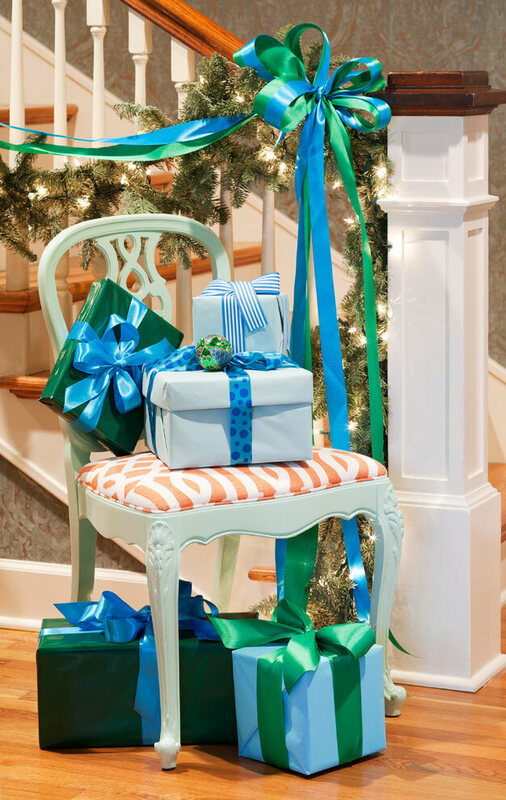 Incorporating bright green and blue holiday ribbons throughout, this look will make everyone smile and wonder how they will open these gifts without messing up the beautiful wrappings. Bring out your favorite antique chair as a display base and have fun showing off your beautiful decor! With a mirror-like finish, this artistic glass ornament will give an extra shimmery glow to your Christmas tree. Its classic stained glass style gives it a traditional feel, and its sturdy silver piping works in perfect contrast to the delicate blue glass. 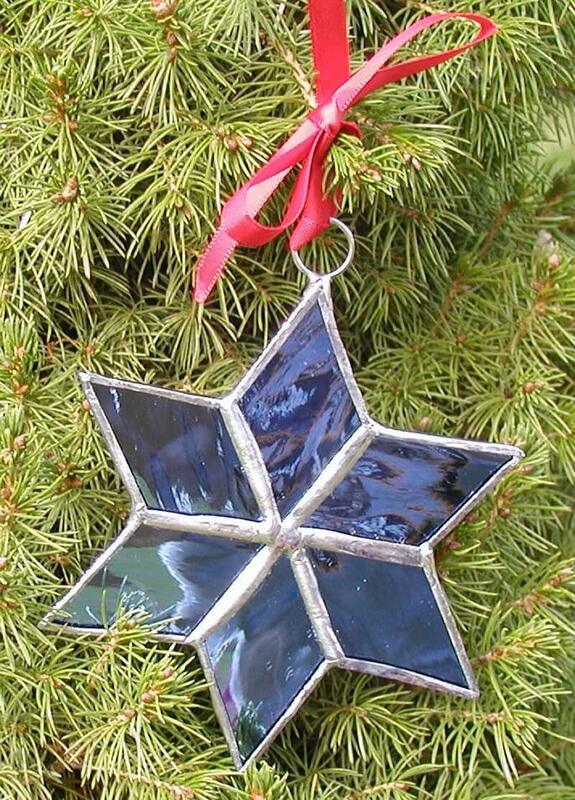 This ornament would look great on a tree alone or would pair nicely with matching stars. This fun mixed and matched garland offers you the chance to show off all your favorite ornaments that may not fit on the tree this year. Incorporating greenery, pinecones, ribbon, bulbs, and more, this display is over the top with its limitless possibilities. Weave in your favorite colors and components to make this a personalized holiday masterpiece. Sometimes for Christmas, you want it all – the simple charm of being home for the holidays but also the vivacity that the Christmas season inspires. This fireplace display is the perfect balance of both worlds. Juxtaposed in perfect harmony, these shimmery metallic trees paired next to antlers, candles, and natural greenery truly create a look that has something for everyone.